With an area of 622 984km2, the Central African Republic is the 20th largest country in Africa and one of the poorest in the world. Its economy is highly dependent of the primary sector. Whereas distribution of income is deeply unequal, the unstable political situation and the violent confrontations between different armed groups all around the country weaken the economic growth, especially from 2013. IPIS has drawn a map presenting the main natural resources exploited in the country. Exploitation of natural resources represents more than half of the gross domestic product (3.206 billions Usd). Timber, gold and diamond account for most export earning. Oil prospective research takes place in the northern and southern parts of the country but no significant exploitation was declared yet. Finally, the north and east of the country are the scene of poaching and hunting activities. 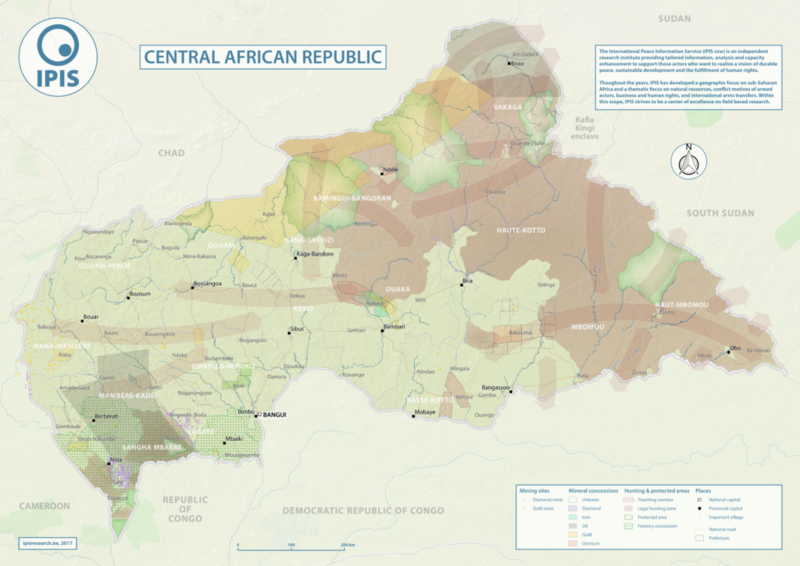 This map is part of a wider project of conflict mapping in the Central African Republic, sponsored by the U.S. Department of State.